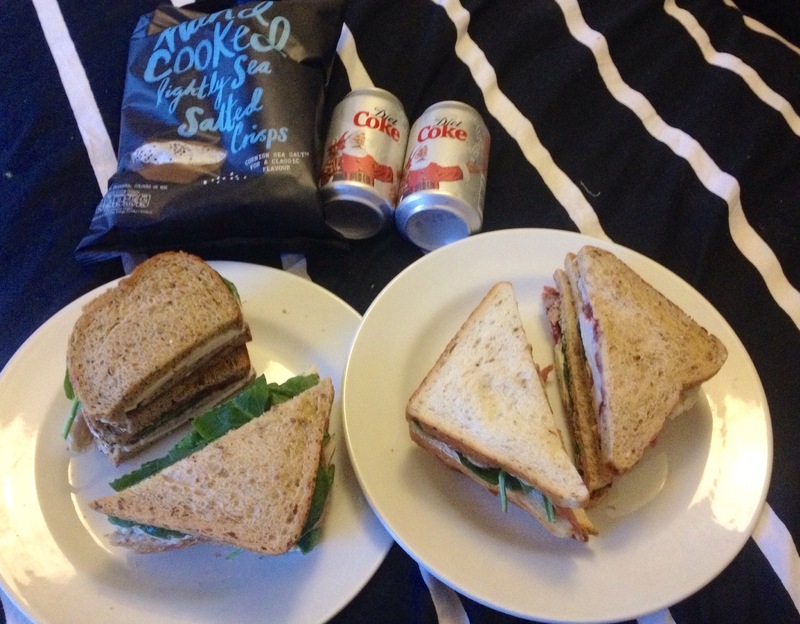 Today was the day that I finally got round to sitting in bed eating Christmas sandwiches. It’s been a while since I decided that I was going to take my obsession to the next level and do an extremely serious review of the best thing that’s come out of christmas since brie and cranberry filo parcels. I intended to review at least 6 but due to Stratford’s lack of Christmas cheer I could only get my hands on 4 so this is Part 1 of a 2 part turkey feast. In the running are Pret A Manger, Eat, Waitrose and Mark’s & Spencer’s famous Christmas creations. It’s pretty simple; turkey, stuffing and cranberry jammed in-between two slices of bread with a selection of different toppings and garnishes that set each one apart from each other. Prêt A Manger – Pret’s Christmas Lunch £3.60. 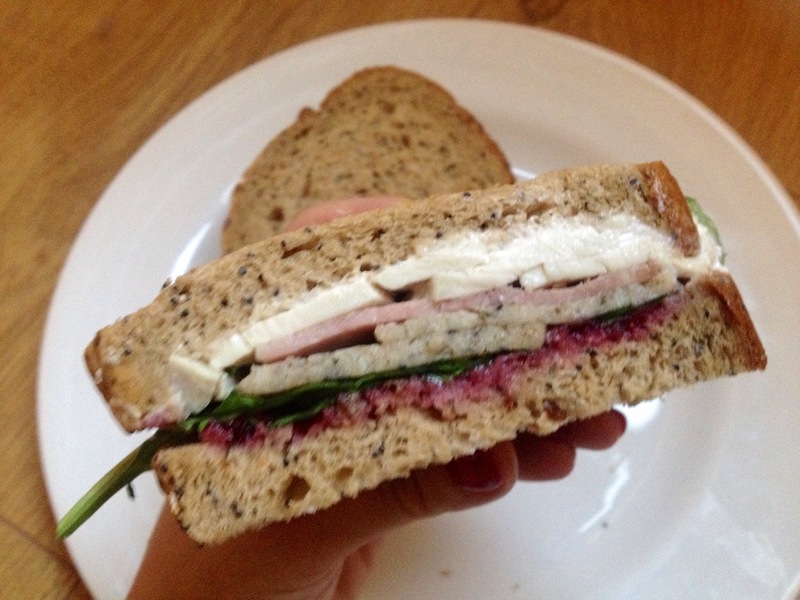 Thick slices of Lincolnshire turkey breast on malted bread with a dollop of slightly tart cranberry & port sauce. Served with Pret herby stuffing – made with beautifully seasoned minced pork, streaky bacon and apricots. Topped with crispy onions and fresh baby spinach. 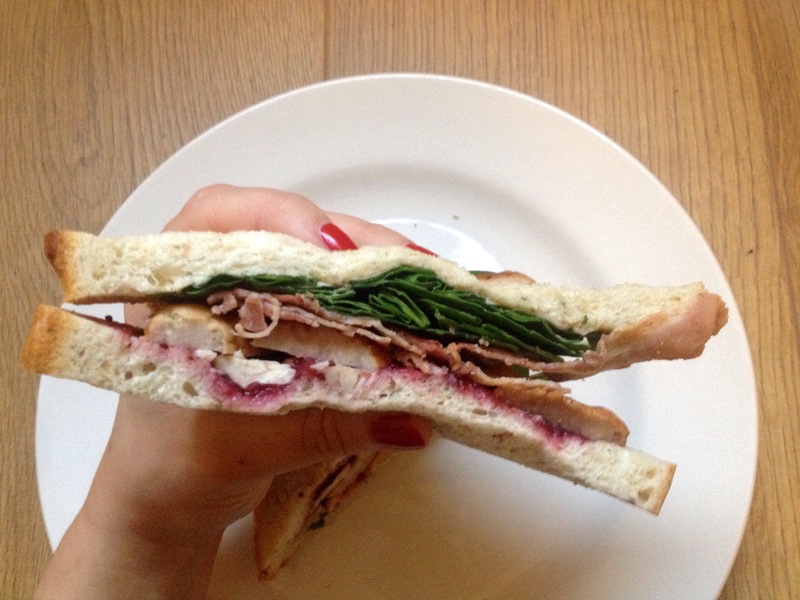 Waitrose – Christmas Edition Turkey Sandwich £2.40. 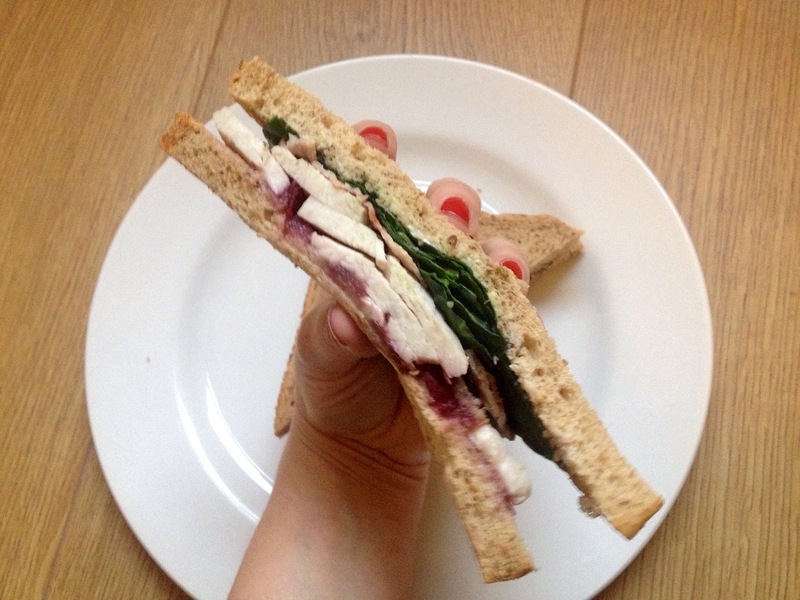 Turkey and pork, chestnut and thyme stuffing, spinach and smoked bacon with mayonnaise and cranberry, port and orange chutney in slice malted bread. Eat – Festive Full Works Bloomer £3.75. Turkey, Cranberry Sauce, Pork Sage & Onion Stuffing, Smoked Ham, Reduced Fat Mayonnaise, Salad Leaf, Cornflour, Black Pepper, Multiseed Bloomer Bread. M&S – Turkey & Pigs in Blankets £3. 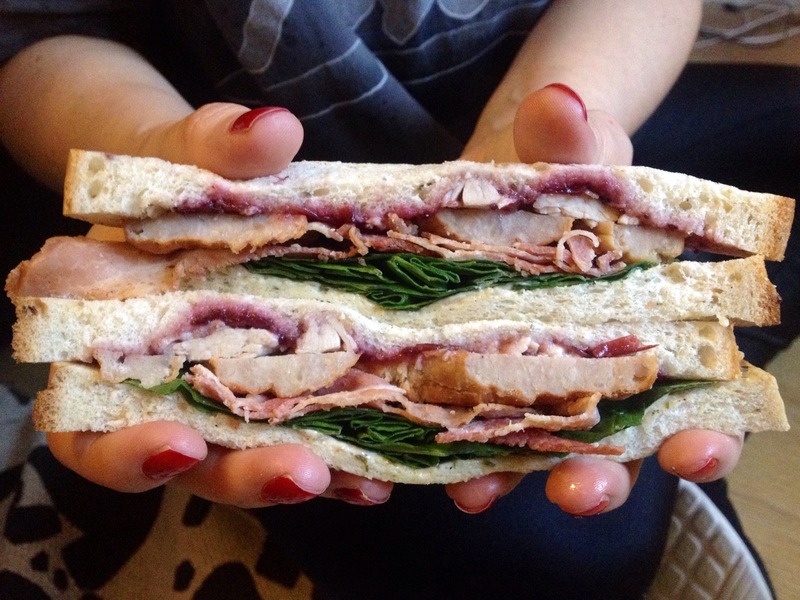 British pork sausages and british bacon, british butter basted turkey breast, cranberry chutney, spiced mayonnaise and spinach on sage and onion bread. Before you get an image of me sat in bed alone on a Sunday consuming 4 Christmas sandwiches let me explain that I had two little (Santa’s) helpers to give me a second opinion and lighten the load. The judging process wasn’t easy, we had to keep going back and forth to check if we preferred one to another and although there were some obvious winners and losers it was still tough to be sure we had ranked each one correctly. In the end there was disagreement on the winners but this is my blog, so only my opinion counts. 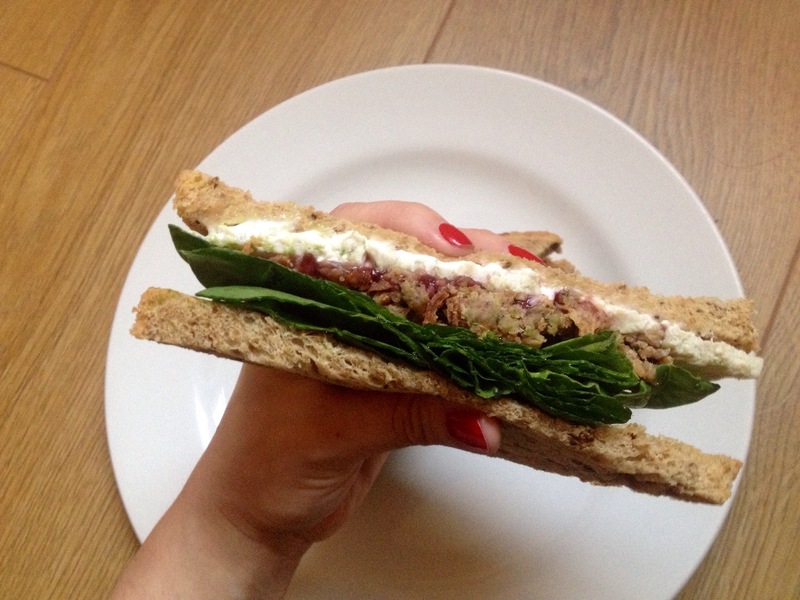 4th Place: Waitrose – This was an extremely disappointing sandwich, it lacked flavour and each element tasted pretty much the same. Unlike some of the others it did have a lot of turkey but unfortunately it tasted like nothing so it was pointless. It looked good and was the cheapest of them all but it wasn’t worth the calories and definitely isn’t worth your money. 3rd Place: M&S – Each year M&S up their game with their festive selection and I seriously applaud them for that. I decided to sample their newest addition which is the Turkey & Pigs in Blankets sandwich and it was a highly enjoyable. My only issue was the minimal amounts of turkey and that the flavour of the sausage was slightly overpowering. Their traditional Turkey Feast is also a good one so I’ll review that in part 2. 2nd Place: Prêt a Manger – This was where Chloe and I had to disagree because for her this was the winner. I don’t disagree that it’s an amazing sandwich and it was pretty close but the unnecessary amount of spinach ruined it for me. They could do with cutting out half the spinach and adding in extra stuffing or cranberry. The crispy onions are a wonderful addition and Waitrose could take a leaf out their book when it comes to flavour. 1st Place: Eat – This was the absolute winner for me. It was moist, tasty and perfectly proportionate. It looked the best and definitely tasted the best. The bread was seedy, soft and wholesome and all the ingredients worked perfectly together. The layer of smoked ham works really well and gives the sandwich an extra dimension that the others lack. Thanks to this masterpiece I now feel the need to spend an afternoon in Eat sampling all the festive treats on offer and I have high hopes for the entire selection.